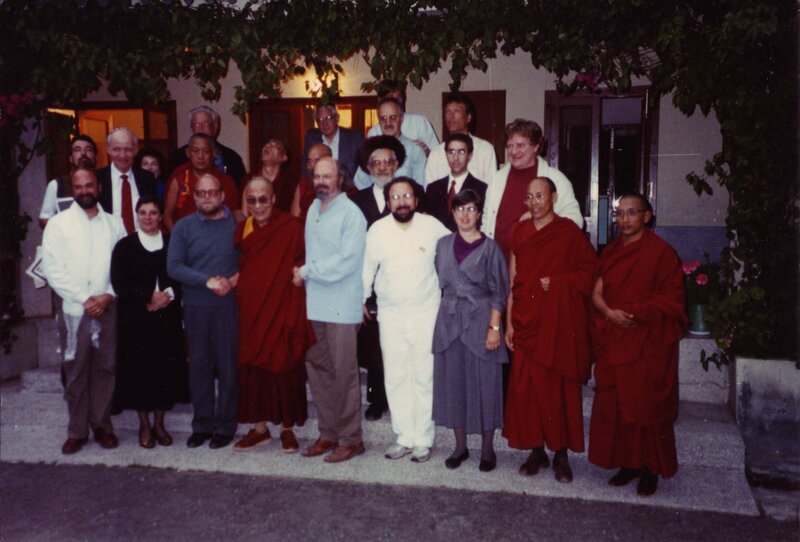 Participants in the 'Jew in the Lotus' Dialogues, Fall 1990. In the back row are Rodger Kamenetz and Rabbi Jonathan Omer-Man; in the middle row are Rabbi Yitz Greenberg, Rabbi Zalman Schachter-Shalomi, and Dr. Robert Thurman; and in the front row are Dr. Marc Lieberman, Blu Greenberg, Dr. Nathan Katz, His Holiness, Tenzin Gyatso, the 14th Dalai Lama, Dr. Paul Mendes-Flohr, Rabbi Moshe Waldoks, Rabbi Joy Levitt, and the secretary of the Dalai Lama on the end. Two sticky notes on the back of photograph with lists of individuals in photos. Approx. 4 in. x 6 in. glossy color photo with minor warping. Digital photo scanned at 800dpi and cropped to photo area. Copyright and other restrictions may apply. User is responsible for compliance with all applicable laws. For information about copyright law, please see https://www.cusys.edu/DigitalLibrary/copyright.html.